How can Doobert help your organization? Home arrow_forwardHow can Doobert help your organization? At Doobert, we are proud to support animal rescues and shelters in the United States and around the world. We recognize the commitment and hard work of these organizations and their volunteers, and we want to do our part to help them be successful. Doobert helps animal rescue organizations just like yours with software designed to simplify the animal rescue process. It allows rescues and rescuers to focus time and resources on saving more of the estimated 3-4 million companion animals that are euthanized each year. Transport is one of the most difficult processes to manage and that’s why we started there first. At Doobert, we’ve made it easy for you to start and manage your own transports. You simply enter the from/to locations and we plot the route on Google Maps and we automatically notify the thousands of volunteers in our database based on their distance from the route. Then, you sit back and watch as people sign-up for the legs and all of their information is captured on the Info tab or run sheet. And our iPhone and Android apps make it easy for your volunteers to be mobile and update you on the progress along the way. The more volunteers we have, the more volunteers YOU have so help us grow the database by sharing Doobert with your existing volunteers, adopters, friends, family, etc. Each user has their own profile and they get to determine which transports they want to participate in. Our volunteers are your volunteers and we are proud to support you. We know that fundraising is one of the critical activities that all animal rescues and shelters need to do so we’ve done our best to make it simple. 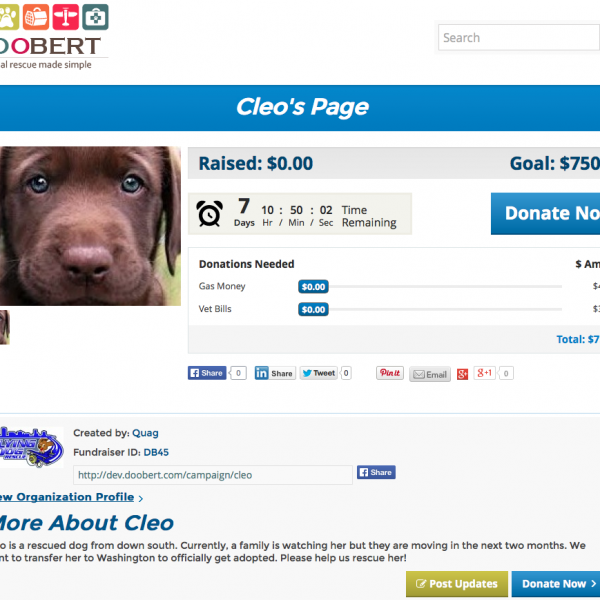 With Doobert, you can easily setup a new fundraiser for a specific animal and quickly post it to social media. We track the donors and even let you specify the items you want people to donate money for. And to make it easy on you, all you have to do is enter your PayPal email and the money goes right into your PayPal account. And of course if you want to create a fundraiser for your organization you can do that as well with just a few clicks. Whatever we can do to make things easier…that’s our goal. And there’s so much more you can do! Search and find partner organizations to work with – you can see their list of available animals and make yours available to them. Find new foster homes, virtual volunteers and in-person volunteers in addition to drivers and pilots. Link up your animals onto trips that other people are already taking. We’re revolutionizing animal rescue transport again; users can indicate their upcoming trips for vacations, weekends, etc. and you can search these trips to hitch a ride for an animal.